Four years after Flint, Michigan, made headlines for poisoning residents with contaminated water, Elon Musk is promising to help find a solution. When a Twitter user openly challenged Elon Musk and questioned whether he was capable of providing clean water to residents in Flint, Michigan, he responded and pledged his commitment to the cause, which sparked a campaign to help the citizens who have been neglected by local and state governments. The clean water crisis in Flint began in 2014 when the city’s local drinking water was changed to a cheaper source, which was not sufficiently treated, and more than 100,000 residents were exposed to alarmingly high levels of lead in their drinking water. For now, reply to my tweet with ppm & ppb test results & will send someone to install a water filter. Creating email [email protected], but I’m in China so that won’t be working until tomorrow. At least 12 people died in Flint between June 2014 and November 2015, after they were among more than 100 people affected by an outbreak of Legionnaires’ Disease in the area, which was tied to poor water quality. Five state and city officials were charged with involuntary manslaughter last year, for failing to alert the public about the deadly outbreak. You’re right on both counts. Most houses in Flint have safe water, but they’ve lost faith in govt test results. Some houses are still outliers. Will organize a weekend in Flint to add filters to those houses with issues & hopefully fix perception of those that are actually good. While Gov. Snyder claimed that clean water was restored, Flint residents are not convinced. Ariana Hawk, a mother of five, told WJRT that after three of her children developed severe rashes from unknowingly drinking contaminated water, they have switched to using bottled water, and do not plan on switching back anytime soon. Mona Hanna-Attisha, a local pediatrician who began raising awareness about the clean water crisis when she noticed blood lead levels increase in the children in Flint, argued that all of the city’s lead pipes should be replaced because “clean water” is declared. “This is wrong. Until all lead pipes are replaced, state should make available bottled water and filters to Flint residents,” Hanna-Attisha wrote on Twitter. Steve Branch, the acting city administrator, told the New York Times that while more than 6,000 lead pipes have been replaced, the city still has as many as 12,000 lead pipes that still need to be replaced. In response to questions about how Musk planned to actually help residents in Flint, local activist Mari Copeny took to Twitter to share that she had been working with Musk for several days before the news of his interest in helping Flint went public. Extremely grateful for him and all he has done so far. 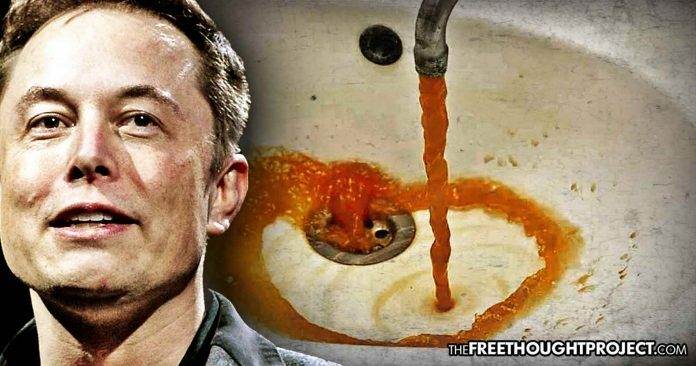 While some critics are skeptical of how Elon Musk will help residents in Flint who were poisoned by their local government and have lived in fear ever since, the fact is that the billionaire is pouring time and money into working with local activists to make a difference, and the spotlight he is shining on Flint could have long-term effects for the impoverished residents who feel like they have been left behind.